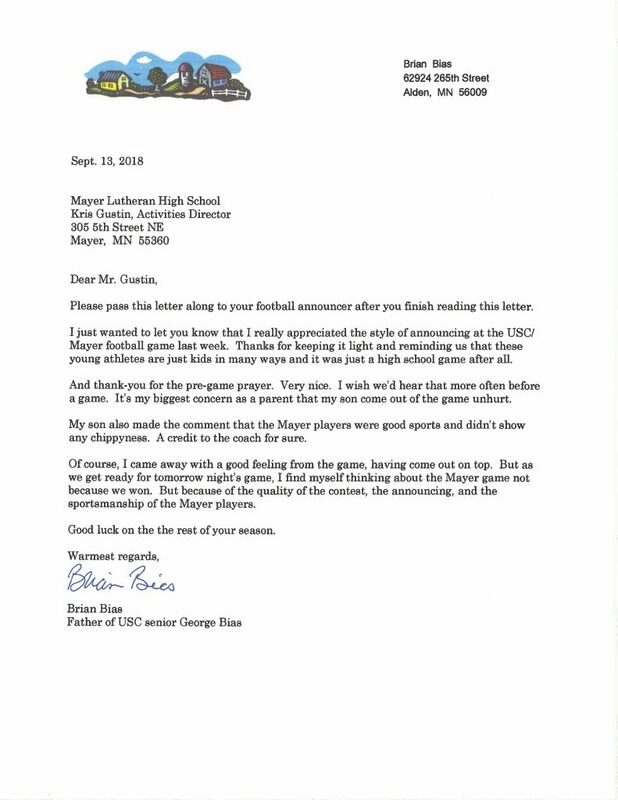 MLHS activities director Kris Gustin received this letter in the mail this past Monday, Sept. 17, and we’re sharing it here with the permission of the letter writer, Brian Bias. It was written the Thursday following the Crusader varsity football team’s 28-21 loss to United South Central (USC). Please pass this letter along to your football announcer after you finish reading this letter. I just wanted to let you know that I really appreciated the style of announcing at the USC/Mayer football game last week. Thanks for keeping it light and reminding us that these young athletes are just kids in many was and it was just a high school game after all. And thank you for the pre-game prayer. Very nice. I wish we’d hear that more often before a game. It’s my biggest concern as a parent that my son come out of the game unhurt. My son also made the comment that the Mayer players were good sports and didn’t show any chippyness. A credit to the coach for sure. Of course, I came away with a good feeling from the game, having come out on top. But as we get ready for tomorrow night’s game, I find myself thinking about the Mayer game not because we won. But because of the quality of the contest, the announcing, and the sportsmanship of the Mayer players. Good luck on the rest of your season. Thank you, Mr. Bias, for your kind words! And thank you to our announcer, Tom Marcsisak, football coach Dean Aurich, and the football team for representing Mayer Lutheran and their Lord and Savior so well!